Ok, I'll spare you the history lesson. You can google how pasta came to the Jewish world. I've touched on the subject a tad here. Both Jonathan's grandmother, who was very opinionated and had loads of yarn, and her youngest sister, who was a gentle southern Jewish belle (Imagine?!) with pretty cheekbones, made this kugel from one of the temple's sisterhoods cookbooks, I gather. It is, to this day, my favorite noodle kugel. Upon a quick search, turns out, it is a pretty standard protocol, as far as noodle kugels go. I adjusted it a tad, but in all honesty, you will probably find a similar version in your sisterhood cookbook or upon a quick google search. I am not happy with the photograph, but when I presented a question on social media, here and here whether or not to post the recipe or not, since my focus is more Mediterranean and Indian and not Eastern European, the answer was unanimous, a resounding YES! Can you still hear the echoing yesyesyesyes... fading into oblivion?! So here by popular demand I present to you the sweet mac and cheese. What?! This post is so light hearted cause' for some reason today I am delirious! Pre-heat oven to 350F. Grease a 8X12 pan with some butter. Bring a large pot full of water to a boil, add the egg noodles, reduce the heat to medium and cook for a few minutes until al dente. Drain. In a large bowl whisk together the sour cream, cottage cheese, eggs, vanilla, pineapple with juice, sugar and raisins and mix. Add the cooled down noodles to the wet mixture in the bowl and mix. Pour the noodles into the greased 8X12 pan and dot it, on top, with the butter cut into small pieces. Bake for 30 minutes, rotate pan and bake for 30 minutes longer or until golden on top and the noodle kugel is settled with no liquid remaining in it. Let it completely cool before cutting and serving. Best served after being chilled in the fridge overnight. Can be cut into squares once chilled overnight and frozen in a Tupperware lined with parchment paper. Thaw in the fridge. Author's note: Even with 1 cup sugar the kugel is lightly sweetened. I hate to admit this, but I really can't remember if I've ever eaten a kugel. I'm guessing that means that I need to get on the ball and make one for myself. Love the bit of history that goes with this dish, too. Great kugel. I'm posting one later today which is similar but different. That time of year, i guess! I'm intrigued by the pineapple and raisins. This sounds delightful! I love kugel. And the addition of pineapple only makes it that much better!! Wow that is so different, never tried something like this! I'm glad you decided to share this with us!! It's very unique and I bet tastes just delicious! I have yet to have noodle kugel! But I love every "pasta" haha. This is a new one for me. It sounds just delicious though! I have never had kugel! I really need to give it a try. 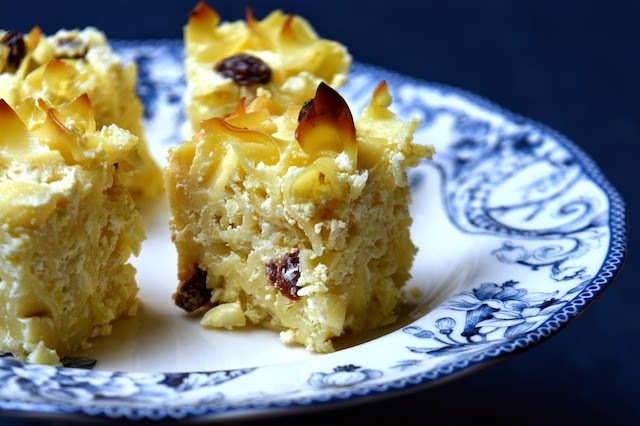 I've never had kugel either, but I love that this one has pineapple. Sounds like something I'd love. I am glad you posted this recipe, Shulie and I actually think your photo is lovely. The focus you have on that kugel is amazing!!! I too am on that slippery slope between grumpiness and maturity (how the hell did I get here?) and wouldn't want to retire to Florida either...but back to your recipe...I love the mix of flavors going on here. I can almost taste it in my mind and I that texture has me swooning with delight! The pineapple excites me! My boyfriend thought I was crazy when I added some to my baked penne. Such an interesting flavor combination! I can't wait to try this! I've never had kugel either but I will definitely give this a try! I do want to eat it every time I go to a jewish deli but I always get matzo ball soup and a reuben. Creature of habit. My grandparents were among the first wave at Century Village. That is just the coolest dish on the block. And the photo is gorgeous. It made me want to dive right in. This looks very much like how I remember my grandmother's recipe. I will definitely have to try it and see if it tastes like the kugel of my childhood.